Sleeping at the wheel, while driving, is considered an offense equal to drunk driving. So pull over to sleep a while. Take a nap. It’s good for a person’s mind. Resting both one’s vehicle, and self, helps refocus direction for any length journey ahead. Losing lost time because of rushing, or running into something dead tired is less productive than relaxing, resting it up and taking it on fully rested is smart living. Vacation; ah the best word in the world. Take it, let it happen once in a while. Some people take a break every three months for a week or two. It’s good to relax. If you have a team handling your life’s business, or your company; people you trust because they add value to “Your Life’s Vehicle”, than take that break. Go bowling, fishing, sleep. Pull over right now and close your eyes for a moment while breathing. Pausing a car ride by pulling over and resting is great. Getting someone you trust to drive while you nap is even better. Take naps while switching up drivers helps two things; A) You get to rest because you deserve it, and B) and the other person can drive while you rest. Your life’s vehicle is important to you, and everyone around you. 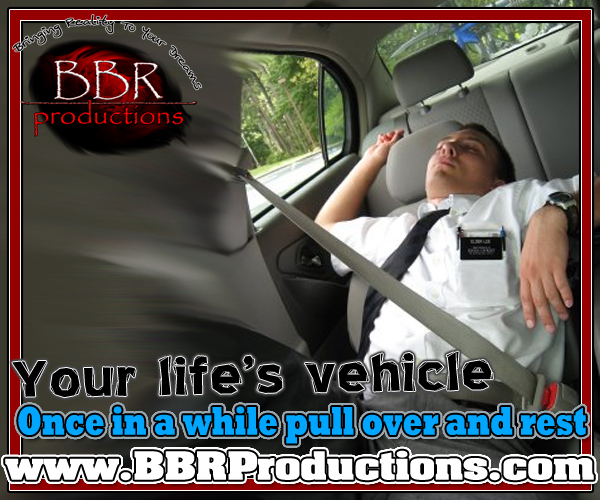 Drive safely, and rest up before taking on action.